Here’s something a little different to take advantage of our brief respite between Friday the 13th and the Ides of March. 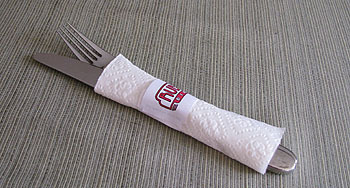 Yesterday Marian and I had lunch at Ruby’s, and as usual our utensils came wrapped in a napkin that was held in place by a paper napkin ring. I have helpfully recreated this setup in the picture on the right. Seems ordinary enough, doesn’t it? But as I unwrapped the silverware I noticed something: a patent notice. This little paper napkin ring, it turned out, was protected by U.S. Patent No. 6,644,498. I was intrigued. What was patentable about this thing? The stickum? It seemed like ordinary Post-It Note type stuff. The size and shape? Couldn’t be. The logo? No. Luckily, the web knows all. When I got home I pulled up the patent to see what it was for. The answer is below the fold. Currently […] Individual paper napkin rings are typically supplied pre-cut into their individual size and stacked one on top of another into a brick of product. When the ring is to be installed on a napkin surrounding a set of silverware, the napkin ring must be peeled from the stack and formed in its ring shape around the silverware and napkin. Thus, a server must use both hands to peel the paper napkin ring from the stack. Therefore, a need exists for a new type of napkin ring configuration such that the napkin rings can be sequentially removed from a continuous strip to eliminate the difficulty in removing a napkin ring from the supply stack. Fascinating, no? 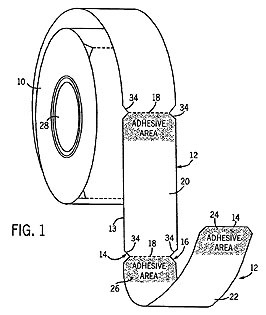 Putting things on a roll has been used for decades in such high-tech applications as, oh, postage stamps and carnival tickets, but apparently if you apply this to paper napkin rings it’s patentable. We live in marvelous times, don’t we?